In July 2013, over 100,000 ecstatic fans packed into Hyde Park for two spectacular outdoor concerts to see Mick Jagger, Keith Richards, Charlie Watts and Ronnie Wood do what they do best. Augmenting the line-up were long-term live touring band members Lisa Fischer, Darryl Jones, Chuck Leavell, Bernard Fowler, Bobby Keys and Tim Ries, who all added their inimitable flair and finesse. Mick Jagger said: "It was a great gig...It was beautiful with the sun going down over Hyde Park. I can't think of a better way celebrate the Rolling Stones' 50 than doing it on our home patch in front of 100,000 people on a glorious summer night...enjoy it... we certainly did." Keith Richards added: "Coming back to Hyde Park was like a full circle being drawn, and the band were in top form. We thought what could be more appropriate than having a great summer in London!" 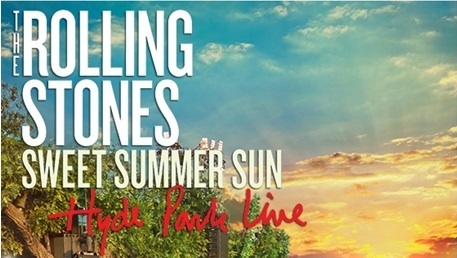 SpectiCast is pleased to announce the theatrical release of The Rolling Stones 'Sweet Summer Sun - Hyde Park Live' premiering worldwide (excluding the UK, Canada, and Japan) on 6 November 2013. 'Sweet Summer Sun - Hyde Park Live' chronicles The Rolling Stones' historic and triumphant return to London's Hyde Park with a 2-hour live concert film. In July 2013, over 100,000 ecstatic fans packed into Hyde Park for two spectacular outdoor concerts to see Mick Jagger, Keith Richards, Charlie Watts and Ronnie Wood do what they do best. Augmenting the line-up were long-term live touring band members Lisa Fischer, Darryl Jones, Chuck Leavell, Bernard Fowler, Bobby Keys and Tim Ries, who all added their inimitable flair and finesse. The Stones delivered a five star performance that had both fans and critics singing their praises. The Stones packed in hit after hit such as, Satisfaction, Start Me Up, Brown Sugar, Jumpin' Jack Flash, Miss You, It's Only Rock 'n' Roll, Gimme Shelter, Doom and Gloom and Sympathy for the Devil. "We are once again excited to be working with Eagle Rock Entertainment and I believe that Rolling Stones 'Sweet Summer Sun: Hyde Park Live' will be one of the biggest Event Cinema programs of the season, says Mark Rupp, Co-Founder and President of SpectiCast. "The energy and excitement of this high-quality concert film is sure to draw music fans across the globe." From the moment The Rolling Stones stepped out onto the stage each night, through to the dazzling firework and pyrotechnic display that heralded the end of the concert, fans old and new were treated to non-stop, hit after hit performances, which took them through the Stones' huge back catalogue. Keith Richards wowed the crowds by weaving his charismatic guitar licks with Ronnie Wood's immense solos. Mick Jagger was on spectacular form, and his boundless energy on stage matched by a number of stunning outfit changes, and Charlie Watts the unflappable heartbeat of the band, driving the band on through the set. The Rolling Stones 'Sweet Summer Sun - Hyde Park Live' is the perfect way for concert-goers to relive their favourite memories from the gigs, and for all fans to see the band back where they truly belong: live on the stage in their hometown. 2. "It's Only Rock 'n' Roll"
SpectiCast is one of the fastest growing all-digital distribution companies in the world, distributing film, cultural arts events, and alternative content programs to over 1,600 theatrical and non-theatrical venues in 24 countries on six continents. SpectiCast markets and distributes the finest 2D and 3D programs using the industry's most advanced technologies. We distribute programs from some of the world's most prestigious cultural arts organizations including Opera de Paris, The Salzburg Festival, The Paris Opera Ballet, the Mariinsky Theatre, and The Philadelphia Orchestra. Our fast growing slate of alternative content and, "event cinema," includes classic and modern music events from best-selling artists including Paul McCartney, The Rolling Stones, Led Zeppelin, Pat Metheny, Andre Rieu, and Jimi Hendrix, as well as world-class theater events including Great Expectations from London's Vaudeville Theatre, Stephen Sondheim's Company, and Phantom of the Opera from The Royal Albert Hall. SpectiCast also distributes some of the best specialty film programs including its "SpooktiCast" horror genre program, the Women's Edge Film Series, the Laugh Out Loud Film Festival, and many similar programs. SpectiCast is a privately owned and operated firm based in Philadelphia, PA.
Eagle Rock Entertainment is the largest producer and distributor of music programming for DVD, Blu-Ray, TV and Digital Media in the world. Eagle works directly alongside talent to produce top quality, High Definition and 3D programmes, both concerts and documentaries, including The Rolling Stones, Pink Floyd, The Who, Queen, The Doors, Jeff Beck, U2, Peter Gabriel, Paul McCartney and Ozzy Osbourne. Eagle's TV library features over 2,000 hours of programming and there are over 800 titles currently available worldwide on DVD, Blu-Ray and digitally. Eagle is a Grammy Award winning company and has received over 30 Multi-Platinum, over 50 Platinum and over 90 Gold Discs, worldwide. Eagle continues to operate two audio music labels and has recently released both physical and digital albums by Ronnie Wood, Lindsay Buckingham, Gary Moore, Styx and Counting Crows. Eagle is also now a fully-fledged music publisher through its new subsidiary, Eagle-i Music. Eagle Rock Entertainment has offices in London, New York, Toronto, Paris and Hamburg.